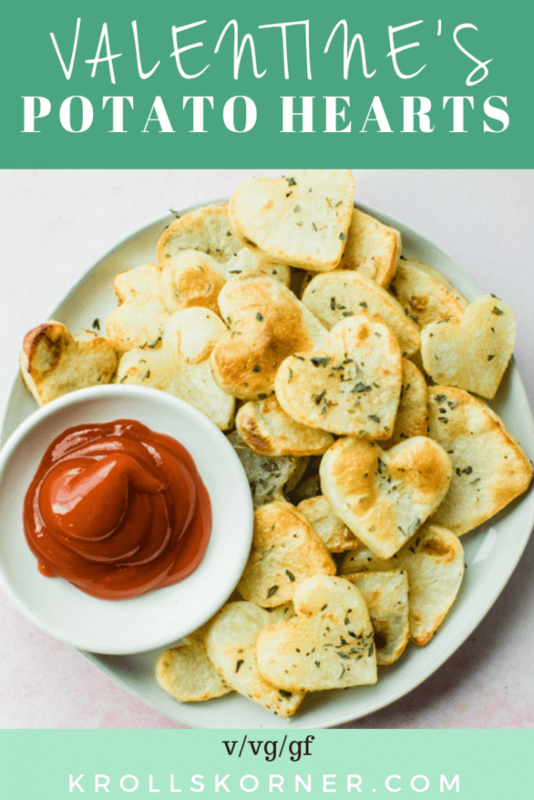 Valentine’s Day Roasted Potato Hearts are the cutest and most festive appetizer or snack to make this Valentine’s Day! Enjoy with your boo or with you girls for Galentine’s! Valentine’s Day is right around the corner and some of you may be wondering what to make if you and your hunny are staying in for a nice dinner. 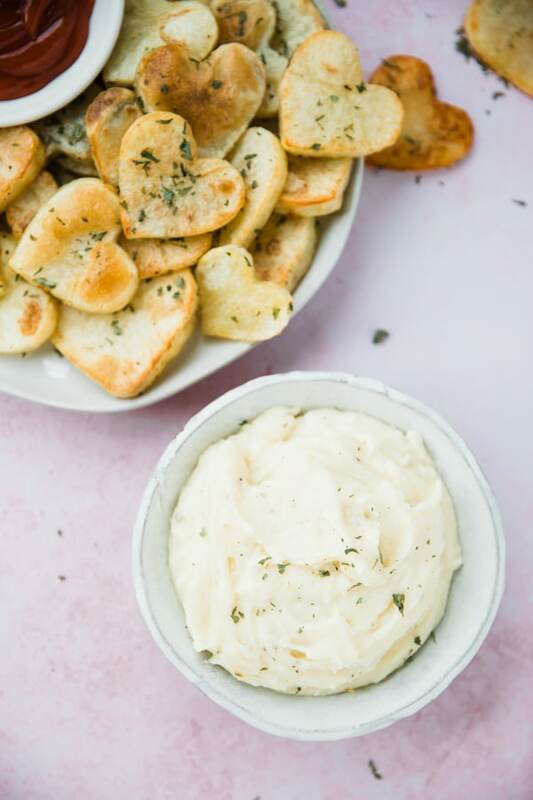 These Valentine’s Day Roasted Hearts are a fun side dish to accompany whatever you may be eating this upcoming Valentine’s Day. Potatoes are great because they are a natural health food! They are packed with healthy carbohydrates, minerals, vitamins and fiber. Potatoes are a good source of potassium as well. The skin of potatoes contains fiber, vitamin B and C, iron, calcium, potassium and other nutrients as well. I don’t use the skin in this recipe, but when eating regular baked potatoes for example, I always encourage others to eat the skin too! First you will wash and peel your potatoes. Then carefully slice the potatoes about 1/2 inch thick or smaller if you want them more “chip” like! Then bring a large pot of water of water to boil. Cook the potato slices for 3-4 minutes then drain and run with cold water to cool them down so they are safe for handling. 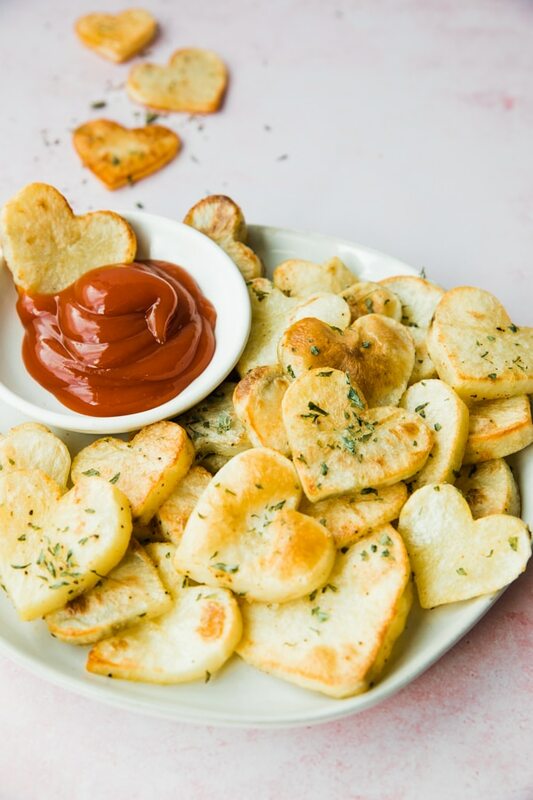 Using a heart shape cookie cutter, (I got mine from Williams Sonoma but Target, Walmart, Sur la Table and many other stores carry them as well, especially this time of year) cut out hearts from the slices of potatoes! Reserve the potato edges to make mashed potatoes! 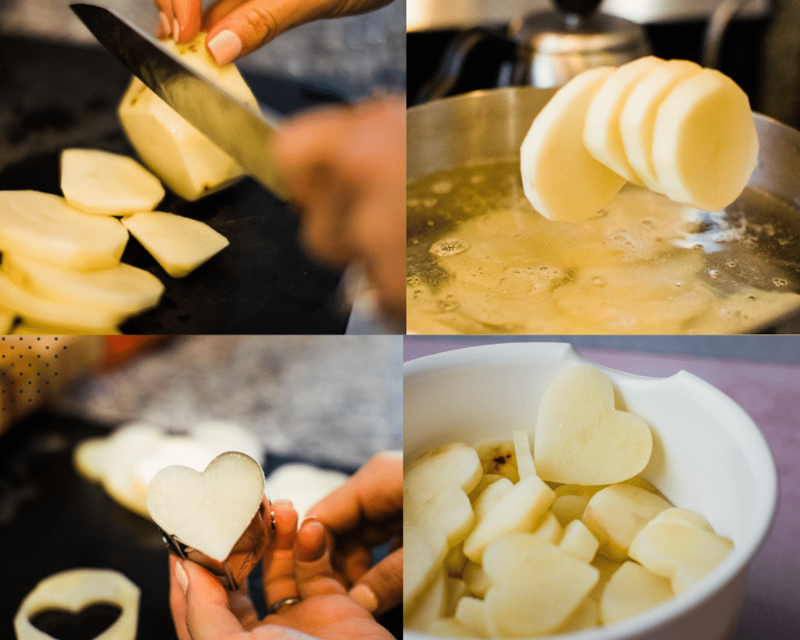 Once you cut each potato into a heart shape, you’ll roast the potatoes in the oven until they cook all the way through and become nice and crispy! A great way to sneak in a healthy starchy vegetable! 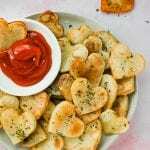 PIN THESE VALENTINE’S DAY ROASTED POTATO HEARTS FOR LATER! Enjoy for a snack or appetizer on Valentine's Day with your significant or celebrating Galentines Day with your girlfriends! 3-6 large Russet potatoes, washed & peeled depending on how much you want to make! Line a baking sheet with aluminum foil and spray with Pam. Set aside. (You may need two baking sheets depending on how many potatoes you use). Fill a large pot with 1-2 quarts water, add 1 tsp. salt and bring to a boil, then reduce to a simmer. Peel the potatoes and slice them about 1/2 inch thick. Place the potato slices into the simmering water and cook for 3-4 minutes. They should be a little soft, yet still a little hard! Drain potatoes and run cold water over them to slightly cool. Using a small heart shaped metal cookie cutter cut out as many hearts as you can. Place the remaining potato scraps in a bowl with water and use them to make mashed potatoes if you'd like. Combine all of the remaining ingredients for the olive oil mixture except the Parmesan cheese, the Parmesan can be used for garnish! Pour the olive oil mixture over the potatoes, stir and let sit for ~5 minutes. Roast potatoes in oven for 22-25 minutes, flipping them over once at the half way point. If your oven has a broiler, broil the potatoes for an additional 5 minutes to get the nice golden brown color. Be sure to watch them carefully so they don't burn! Enjoy dipped in ketchup, or just with the Parmesan sprinkled on top! How cute are these. Potatoes are definitely the way to my heart too! Thank you so much Dannii! 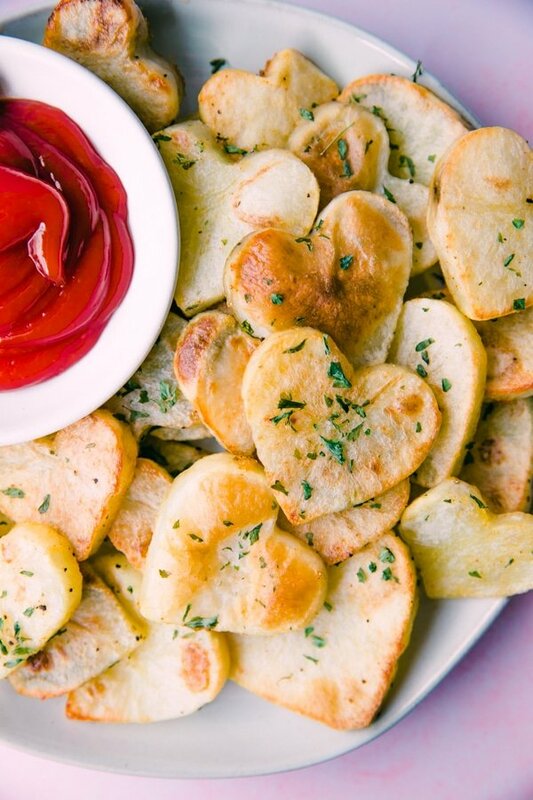 These potato hearts are so cute and such a great idea. Definitely on my menu for Valentine’s day! how adorable!! this is such a fun idea for valentines day. plus, who doesn’t love a roasted potato? This does look like a well rounded meal! I really like what you did with the potatoes, wish I had thought of it. Roasted potatoes are delicious and the appearance of these make them even more inviting to eat. Well done. What a great idea! So easy and fun! The perfect touch for valentines day.